The ACT can make or break your chances at getting into the right college. The ACT is meant to assess your college readiness by testing five major areas: English, Math, Reading, Science, and an optional Essay Writing section. For such an important exam, it is just as important that you prepare for it efficiently, which means that at some point you will have to make a decision on what prep course to take. While there are a number of approaches to test prep, the most important factor in your decision will be your unique learning preferences. Whether you prefer to work on your own or with a coach, in-person or online, there is sure to be an option that is right for you. Because you already have enough to stress about, I have compiled a list of the top 6 ACT prep courses on the market. Keep reading for a breakdown of what each one does best and how they compare to each other overall. Magoosh nails it when it comes to balancing accessibility, content, and budget. With full mobile access to flashcards and customizable practice sets (all backed by a score improvement guarantee and expert writing), you will go into your ACT testing room feeling confident and prepared after completing this course. If practice makes perfect, then practice questions make perfect practice. Princeton Review brings over 3,200 practice questions to the table, as well as the most options on the market. Whether you want to study Self-Paced, Live Online, In-Person, or with a tutor, Princeton Review has a program for you. Testive believes that the most useful resource students can have is the support of professional coaches and their guardians. The ACT course is entirely Self-Paced, but students are given weekly meetings with coaches as well as daily feedback. Testive makes sure you are never on your own when prepping for the ACT. Like I said above, Magoosh has knocked it out of the park with their Self-Paced ACT prep course. Beginning at just $79 (be sure to use my discount code! ), you can have access to 1,200 practice questions, 4 practice exams, a personalized study plan, and email support for up to 12 months. But what makes Magoosh even more awesome is that all of this comes jampacked into a fully dedicated mobile app, complete with flashcards, progress tracking, and video lessons. This ability to learn on-the-go is becoming a must-have in today’s world, and it means that you can take your ACT studying on the bus, in the car to family dinner, or even out to grab a coffee. You will be surprised how much of a difference it can make in your progress to be able to sneak in even five extra minutes of flashcards each day, and this is something that you wouldn’t be able to do if tied to a desktop. Magoosh also comes backed with a 4-point score improvement guarantee—the best out of all of the major companies on my list—so you can feel confident that you are getting materials and advice that work. If you’re ready to take your ACT prep into your own hands, look no further than Magoosh to get you ready for college. As one of the biggest names is test prep, it’s no surprise that The Princeton Review is so high on my list of ACT review courses. What makes The Princeton Review such a star choice is the incredible amount of options they provide for students. My discount code can get you started with a Self-Paced plan for just $299, or you can upgrade to Live instruction (online or in-person—you choose!) for $599. Each of these plans gets you access to the most practice questions on my list (3,200!! ), three proctored practice exams, 18 hours of instruction, and a personalized study plan. There is a real benefit of being able to rely on one company for all of your prep needs. Whether you begin as Self-Paced but realize that a few hours of Private Tutoring would be beneficial or start online and decide instead that you learn better in-person, it’s a relief to know that you can make the switch you need without needing to search again for another prep company. All of The Princeton Review’s courses come with their Princeton Review Guarantee, so you can rest assured that you are getting a product you can trust. PLUS, The Princeton Review’s courses come with access to SAT and PSAT prep, meaning that if you simultaneously prepare if you are also considering schools that prefer SAT scores. If you want the most options on the market and the security of one of the biggest names in test prep, consider looking at the variety of courses on offer from The Princeton Review. For most of us, applying for college can be a daunting task. For those of you like me, it can be downright terrifying. Making choices about what school to attend, what to write for your application essays, what admissions tests to take, and what prep course to use can leave you feeling isolated sometimes. Luckily, Testive is ready for this exact situation and has created a prep course focused on keeping you reminded that this next step in your journey isn’t one you have to take alone. Even though Testive only offers Live Online options, they have found their way to number three on my list because of their uniquely personal approach to ACT prep. Everything in your Testive course revolves around your own personal coach, selected from a number of trained experts who have graduated from top Universities like Yale, Johns Hopkins, Cornell, and more. $399/month gets you access to weekly 1-on-1 coaching sessions, daily performance reviews, and a higher score guarantee. Testive recommends 4-5 months of prep time, which puts them in the most expensive bracket on my list, but the personal attention you receive creates a combination of live instruction and tutoring that is actually a bargain compared to expensive tutoring options like Kaplan. Overall, if you love the idea of personal coaching but don’t want to sacrifice the content and versatility that come with online instruction, look to Testive to meet all of your ACT prep needs. Kaplan, like The Princeton Review, is another famous name in the world of test prep. With that name comes a higher score guarantee, printed textbooks, and the most ACT practice exams you will find on my list. Also like The Princeton Review, Kaplan comes complete with a full range of course options. But keep in mind: while the Self-Paced plan begins at $299 and runs at the same price as The Princeton Review’s, the rest of its instruction packages are much more expensive ($899 for Live Online or In-Person as compared to The Princeton Review’s $599). With that said, however, if you have the ability to fit Kaplan into your budget then you will not be disappointed with the product. Whether you choose online or in-person, the Live courses come with 18 hours of instruction, an extra 14 hours of elective instruction via their online archive of video lectures, 9 practice exams, prep books and a customizable Quiz Bank that lets you learn your way. Each package also comes with the option to upgrade to a PLUS plan, which adds 3 hours of 1-on-1 coaching and a special Math Foundations crash course. Just like with the Princeton Review, it’s great to find all of these resources under one roof. If you like the idea of comprehensive test prep with multiple course options—and you have a little extra room in your budget—Kaplan ACT prep might be the perfect choice for you. Some say that if you want to learn something the right way, then you should go straight to the source. The folks over at the ACT feel the same. That’s why they offer a six-month package of ACT online prep materials that are geared towards teaching you the best ways to prepare and take the exam—organized by the test makers themselves! 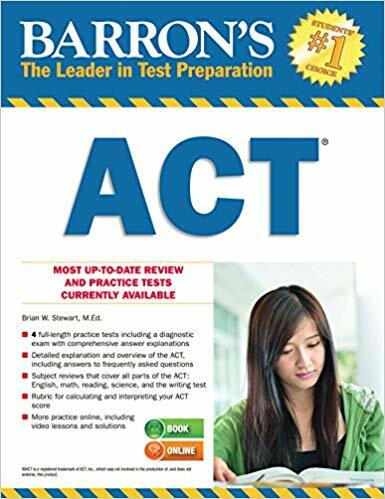 At just $39.95 for six months of access, ACT Online Prep is the cheapest option on my list and makes a great choice for students who want a great test prep option that won’t break the bank. With great features like a dedicated mobile app, flashcards, progress tracking, and a personalized study plan, ACT does not cut corners when it comes to content. Added to all this are 2,400 practice questions and 2 practice exams. What puts ACT Online Prep so low on my list—despite all of these benefits—is the absence of a score improvement guarantee and student support. More importantly, there are none of the video lessons that you find in every other package on my list. If you like the idea of getting your test prep on a budget and straight from the makers of the ACT themselves, then ACT Online Prep provides a good option for students. Just keep in mind that the missing features like student support, video instruction, and score guarantees will mean that your performance will rely heavily on your own dedication. Barron’s ACT Prep is another course that is filled to the brim with features. 25 hours of video lessons, 50 hours of video problem solutions, over 4 ACT practice exams, and 3,000 practice questions. When it comes to number of practice questions, Barron’s takes top prize for giving students a bargain: at $99 it is one of the least expensive options on my list, but it comes in second in the number of practice questions and third in number of practice exams. Barron’s also features computer adaptive lessons, a new method of instruction that means the computer will react to your performance. Your strengths will be identified and perfected, while problem areas will be addressed more directly so that you feel confident taking on even the most difficult questions. Barron’s also allows students to try their software for free before you put any money down. Where Barron’s falls short is in not providing any score guarantees (although you can get your money back after three days if you feel the products isn’t right for you), and not providing options for Live instruction or Tutoring. Barron’s certainly gives students a plethora of practice resources—and cutting-edge adaptive technology—for a competitively low price, so consider signing up for a free trial. After all, what matters most is that the prep course you choose is right for you!